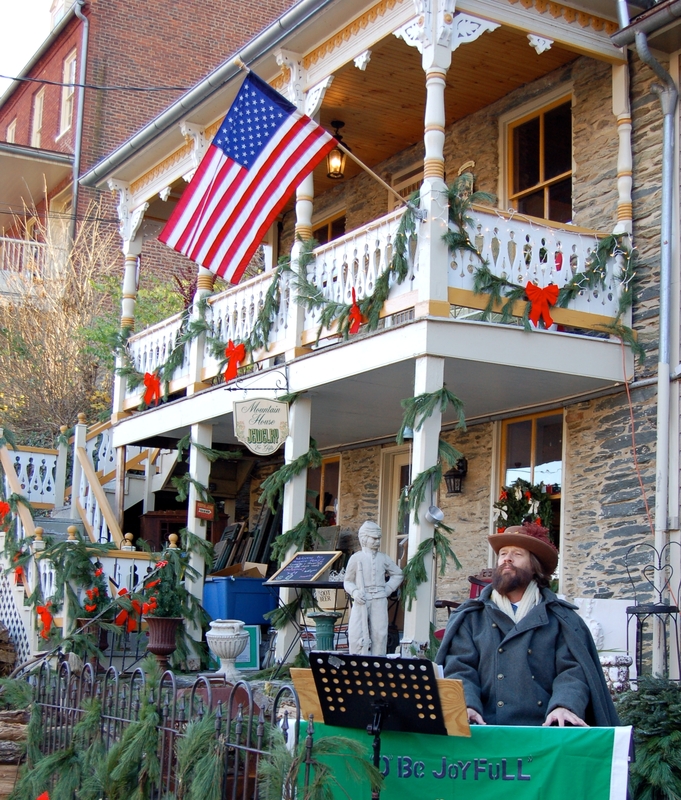 Celebrating the winter holidays in historic Harper's Ferry. Harpers Ferry, West Virginia, (population 315) had a history before John Brown’s famous raid. In 1733 Peter Stephens settled the area on a peninsula at the confluence of the Shenandoah and Potomac rivers. Robert Harper purchased Stephens’ land in 1747 and ran a ferry across the Potomac River. Thomas Jefferson is even quoted as saying the scenic grandeur of the site was much admired. George Washington proposed the C&O Canal be built along the river past Harpers Ferry. Washington also chose the town as a site for the United States Armory and Arsenal, with construction beginning in 1799. Between 1801 and the Civil War, the armory manufactured most of the United States’ arms and even supplied the expedition of Lewis and Clark. It was the first place interchangeable parts were used in manufacturing in the world. After 1842, the armory and arsenal became a source of work and wealth for the town. Population reached almost 3,000. Hotels, saloons, and bawdy houses thrived. In 1851, the Virginia legislature granted the town a charter to organize local government. A mayor, recorder, and nine town councilmen were elected. In 1859, the John Brown raid of the arsenal took place; it is considered the spark that began the Civil War. John Brown, “Commander in Chief” of the “Provisional Army of the United States,”and his men attempted to seize the federal armory and arsenal to liberate slaves and end slavery in the United States. The town suffered through the war and lost its industrial base. With the rifle works destroyed, and the town changing hands between rebel and federal armies, military rule prevailed. But after the war, the town became a hub for educating newly freed slaves. By the end of the 19th century, Harpers Ferry was considered a summer retreat for people from Baltimore and Washington. In the mid-20th century, parts of the town became a national monument and a National Historical Park. The entire town is a Historic District, listed in the National Register of Historic Places. It is also a Certified Local Government. Since 2003 efforts to preserve and beautify the town have been carried on by the Harpers Ferry Historic Town Foundation. For 37 years, the town has partnered with the Merchants Association to host Olde Tyme Christmas, two weekends in December filled with activities, performances, and displays reminiscent of a traditional Christmas celebration in 1860. The Harpers Ferry Town Foundation helps to enhance the visitor’s understanding of Harpers Ferry’s place in history with its “Walking Guide to Upper Town Harpers Ferry” highlighting 10 structures in Upper Town and focusing on its architecture and place in the town’s history. The Hilltop House Hotel opened in 1888 and was known as Harpers Ferry’s “Grand Old Lady.” The hotel is currently closed for renovation and reconstruction to redevelop the site as an upscale hotel opening in 2010.